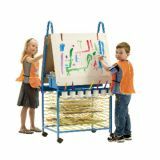 Measures 30"W x 30"D x 611⁄2"-641⁄2"H. Lifetime warranty on frame and tubs. 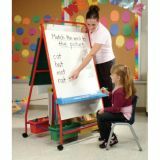 Features: • Slide-out board enlarges work space by 15"W • Removable/adjustable 24" x 36" lined magnetic dry erase board • Sliding tubs for better access with Safety Stops • 1 Really Big Tub • 10 Open Tubs • 8 Tiny Tubs for markers, etc. 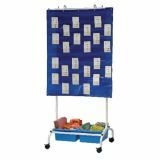 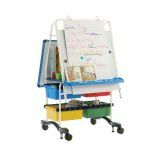 • Telescoping accessory hooks for pocket charts • Top shelf for teacher • Snap-on chart paper/accessory hooks • Large 3" casters • Foot-Activated Brake Mechanism Additional shipping charges apply. 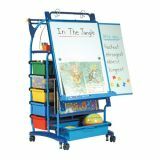 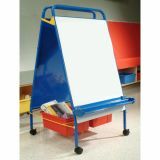 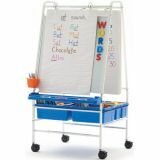 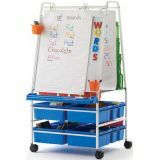 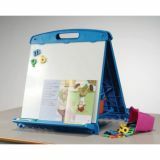 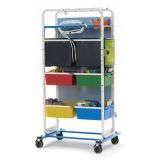 This versatile teaching easel provides an organized lesson center in one compact footprint along with mobility throughout the classroom. 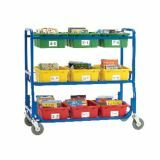 Frame measures 58 3⁄4"H x 32 1⁄4"W x 33"D. 10-year frame and lifetime tub warranty.